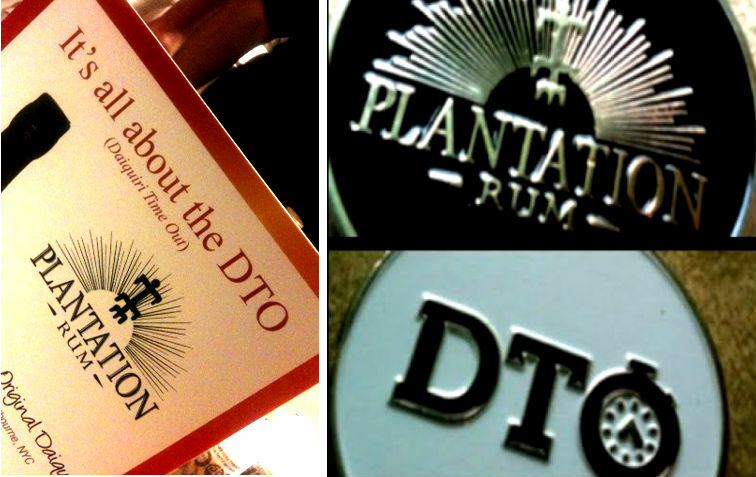 TOTC 2014 – Tastings – Plantation Pineapple Rum, Appleton Rum Brunch and Bulleit New Fashioned! 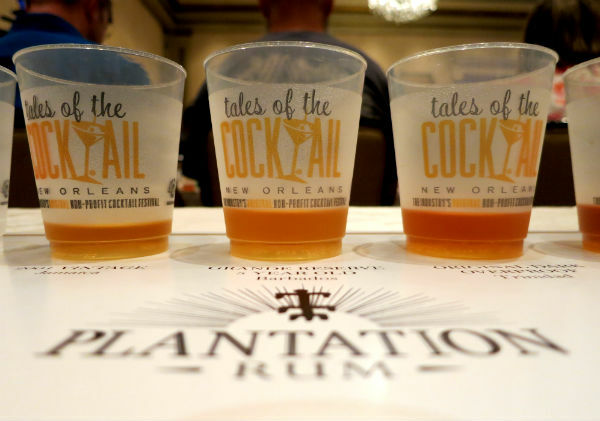 Plantation Rum in Shades of Dark, White and Pineapple! I was waiting with great excitement for the tasting and launch of the Pineapple Rum Stiggin’s Fancy by Plantation Rum – which I need to make it clear right away, is NOT for sale…..because this rum was an experiment by Alexandre Gabriel and David Wondrich….to be launched and tasted at the Tales of the Cocktail…. Well….I was not disappointed, the rum was delicious! 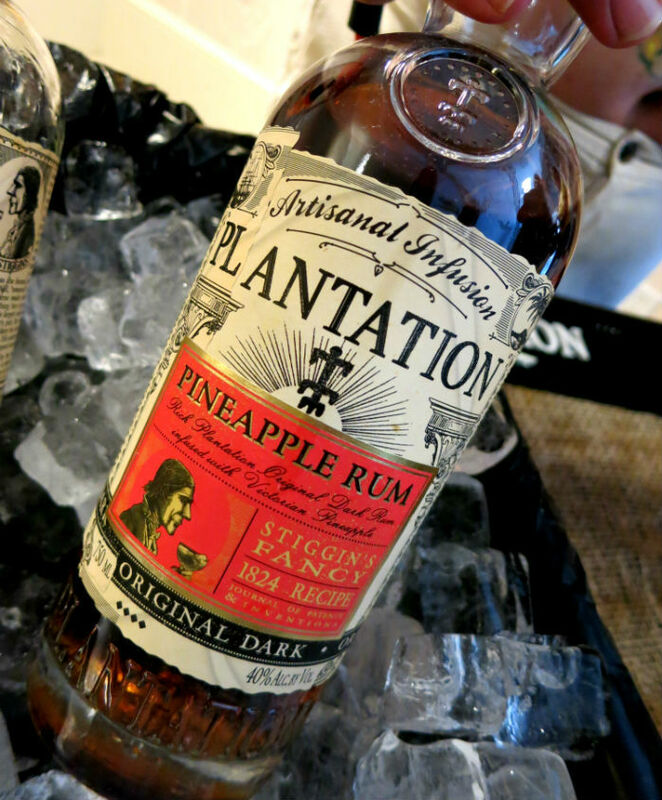 with a deep well matured and slightly smoky pineapple flavor in the background of Plantation rums original dark rum. And the bottle is beautiful!! I asked Alexandre what made the flavor so deep and he told me it”s coming from that the pineapple skin has been distilled – together with pineapple fruit, which also has been macerated. For being just an experiment I think the outcome was really delicious and very interesting! 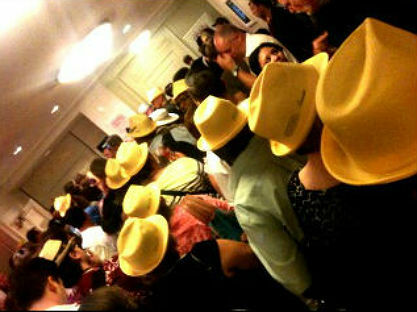 The queue….a nightmare for anyone with a hangover….luckily I was not…and don’t mind all the yellow hats….it’s a Tales thing…. 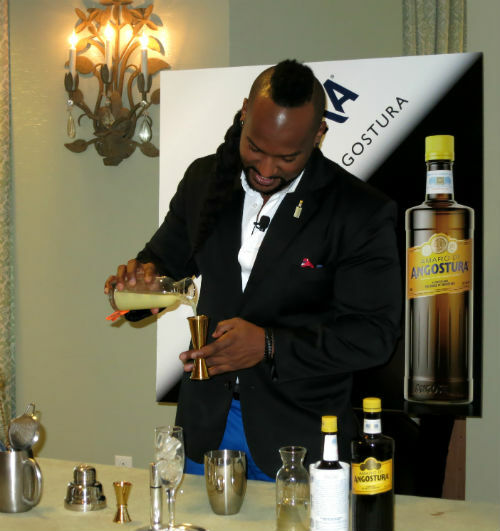 Yours truly with pineapple rum in hand, Alexandre Gabriel – Cognac Ferrand proprietor and spirits mastermind – and more delicious pineapple rum! The DTO – Daiquiri Time Out coin, a treasure/token that was handed out, and which a certain man did drop inside a cab and had the entire cab floor torn up to find it…wherewith the cab driver in utter amazement said that this gotta be a very valuable coin….. But there’s more to the coin than just a token for the fun of it, according to what I’ve heard, navy officers carried a special coin. When drinking, everyone showed their crew coin. If one person did not have their coin, they had to buy a round of drinks. This gave value to the coin and the tradition. 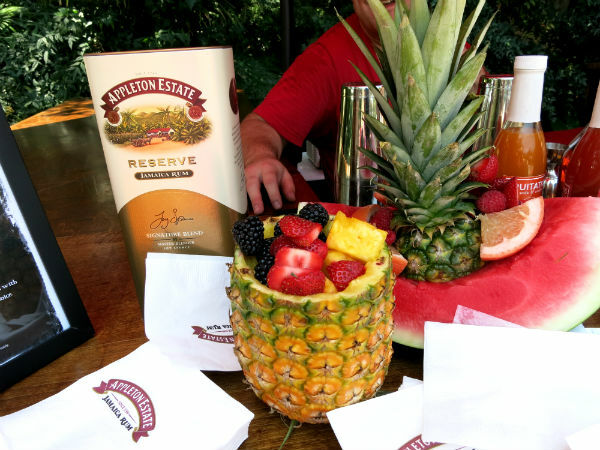 Now I have one wish….that plantation rum makes more of this fine pineapple rum….I could make use of a bottle…launching a delicious rum like this only for the Tales is really a teaser…! 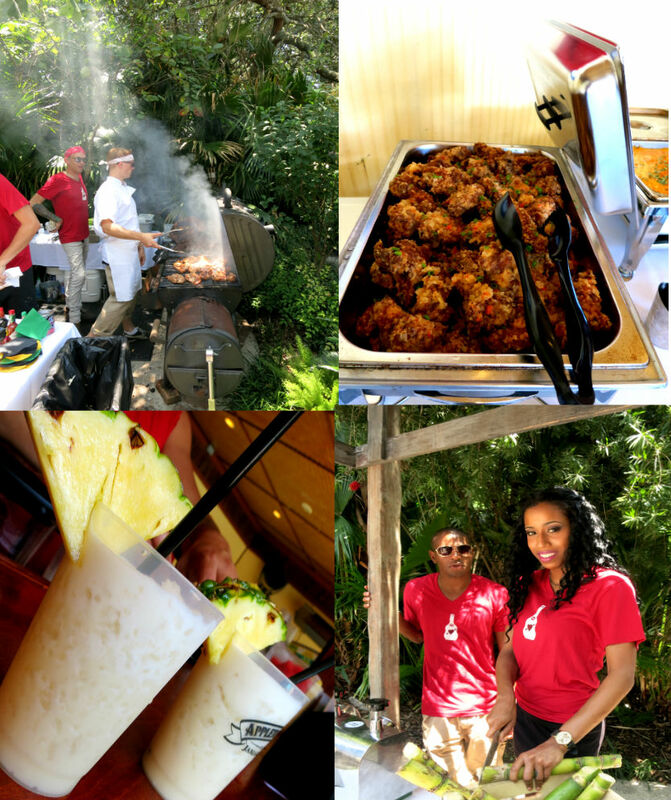 The Appleton Estate Jamaican Bartender’s Brunch – Rum, Reggae, Food, Sun and Fun! Oh my….this was a nice event! a yellow school bus fetching us up outside of Monteleone and serving cocktails on the way to the brunch filled with rum, reggae, Jamaican foods like jerked chicken, lots of fresh fruits and fresh cocktails, Jamaican fizzes, fixes & swizzles made with island flavors and fresh cane juice pressed on site. 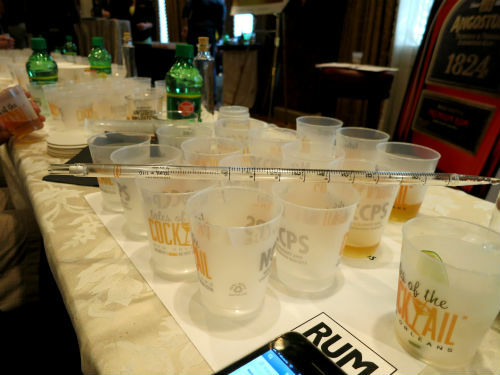 And of course one of my favorite rums was there – the JWray overproof – paired with Sanpellegrino!! 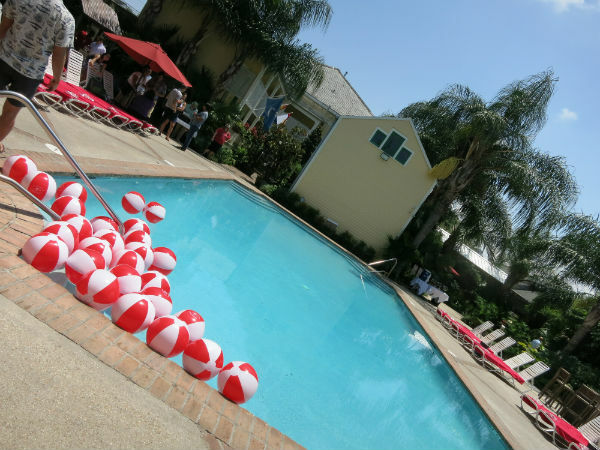 (to sub Ting) plus Aperol…all by the pool at the Country Club. Very very nice on a hot sunny summer day down here in New Orleans. 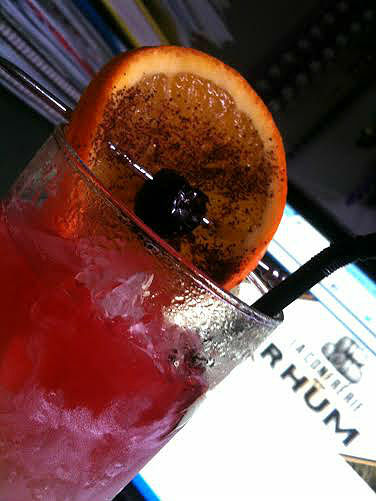 Rum, fruits and fun in the sun! Well….I wouldn’t mind repeating this….that’s for sure. Just look at that pineapple! Or how about this….I dunno….can it get any better?? Jerked chicken, Coladas and sugarcane juice! And time for a JWray shot from the melon….Appleton Rum baby! Please come back next year…. 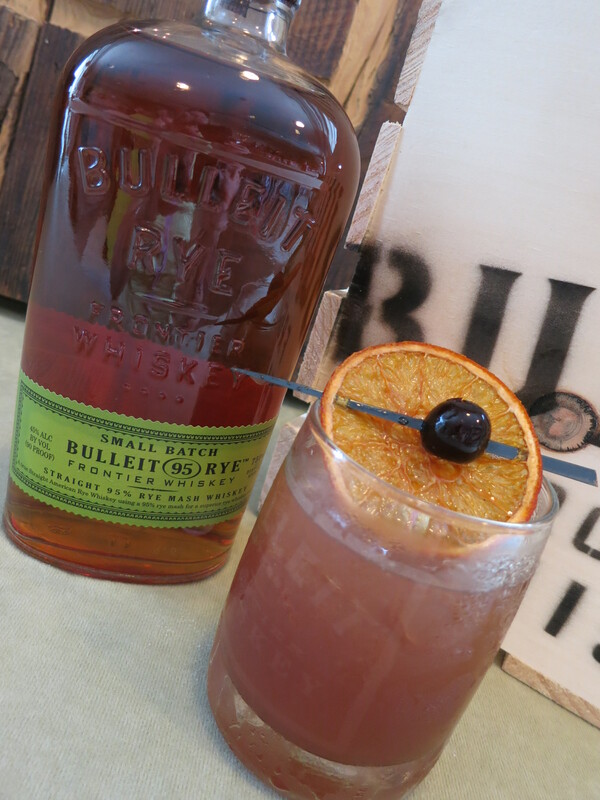 And now to something totally different…..
Bulleit Distilling Co needs no presentation….and this year they had a similar brunch as they did last year which then, was mint julep themed and absolutely fabulous! 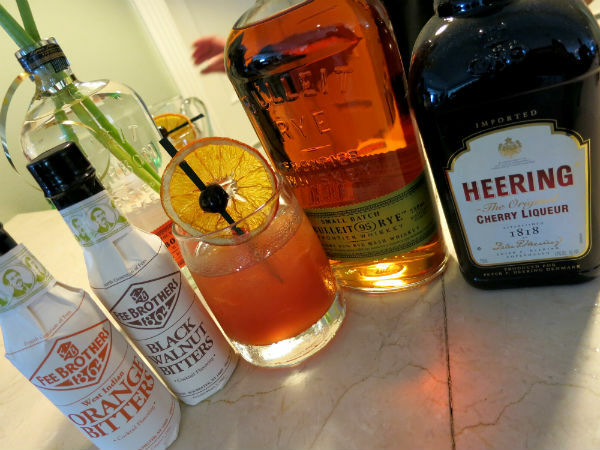 This years theme was the New Fashioned, a riff on the Old Fashioned…with Bulleit rye, Cherry Heering, orange rind, Italian Amarena cherry, Fee Brother’s black walnut and orange bitters. 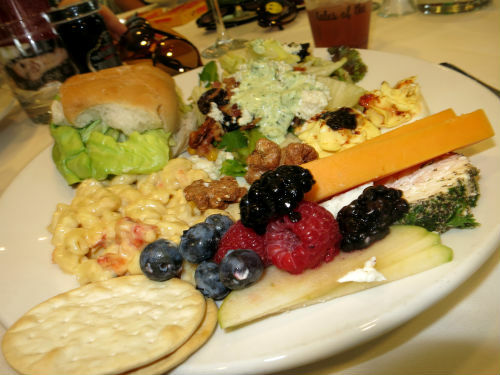 The brunch was of course delicious…catered by Ruth’s Chris Steakhouse and if you haven’t tried their fantastic food it’s time you do if you have a chance. And the New Fashioned cocktail which will be served at Ruth’s Chris Steakhouse was very tasty and the garnish was so beautiful with a shiny black “filthy Amarena cherry” from Filthy Food Premium Drink Garnish, speared on to a dehydrated orange slice. The wild Amarena cherries are slow cooked in copper pots to produce a wonderful all natural, dark red cherry with a sweet front and tart finish. Hollis Bulleit, Helen Mackey, VP of Menu Strategy & Innovation for Ruth’s Chris Steak House and Tom Bulleit, founder of Bulleit Distilling Company presenting the event and their companies, while the crowd enjoyed an excellent luncheon. The Crawfish Monica that was served was fantastic! and everything else too! The ingredients to make the New Fashioned….the only thing not in the picture is the jar of “Filthy Amarena Cherries”. I get thirsty when I see this drink in the picture….and the cocktail WAS good! for people in the US – you can join Ruth” s Chris Steakhouse for a nationwide 5-course handcrafted cocktail dinner with the same menu across the US, participating restaurants and pricing vary, see more at Chris Ruth’s Steakhouse website. 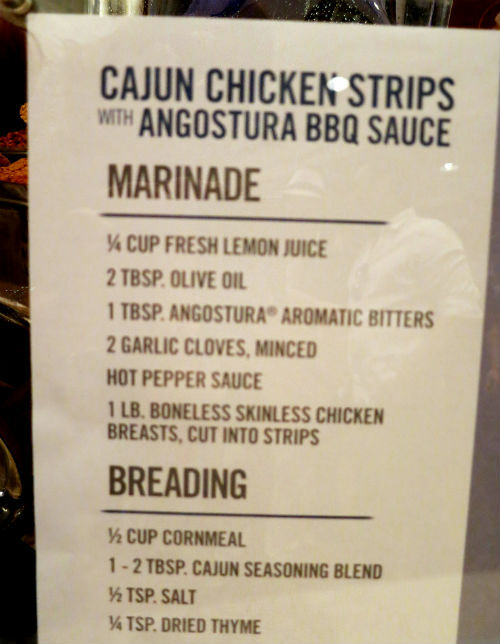 Next up….more tastings, parties, bars and restaurants…the last picture parade from the tales of the Cocktail 2014! 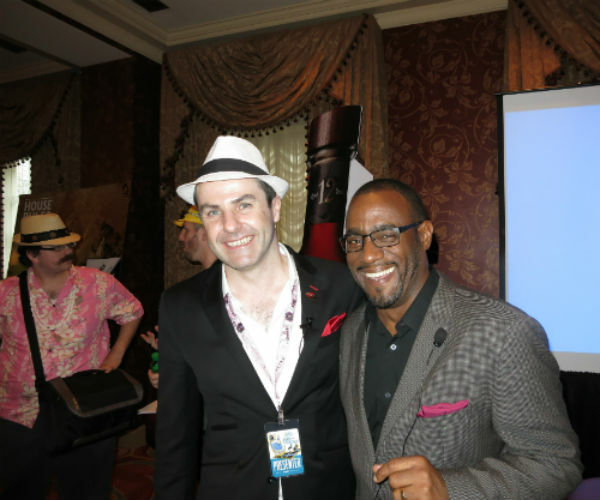 TOTC 2014 – The Tastings! 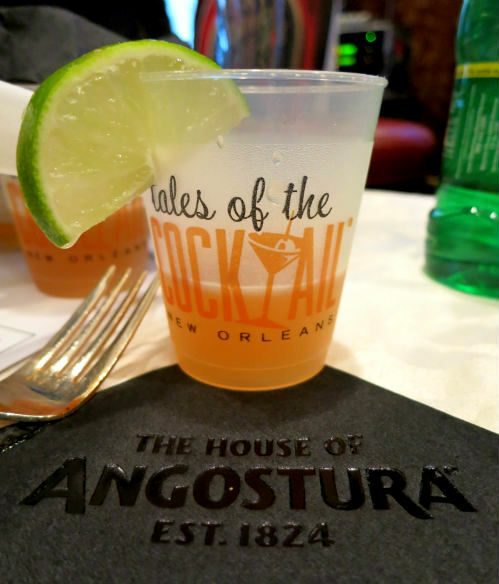 Limited Edition & Vintage Rums and The House of Angostura! If I can….where there is rum and good company…I will be…. And so I camped overnight outside the Acadia-Madewood suite in the Sonesta to be sure to be there in time to catch the rums….well…no I didn’t…haha but I was there for sure!! This was an exclusive interactive tasting seminar featuring a selection of rare editions, vintage rums, limited bottlings and collector’s private stock. It was an entertaining and interesting tasting with rums found principally in the United Kingdom, France, Germany and Italy, among them two fine demerara expressions from Velier and a new rum from Banks not even launched yet. 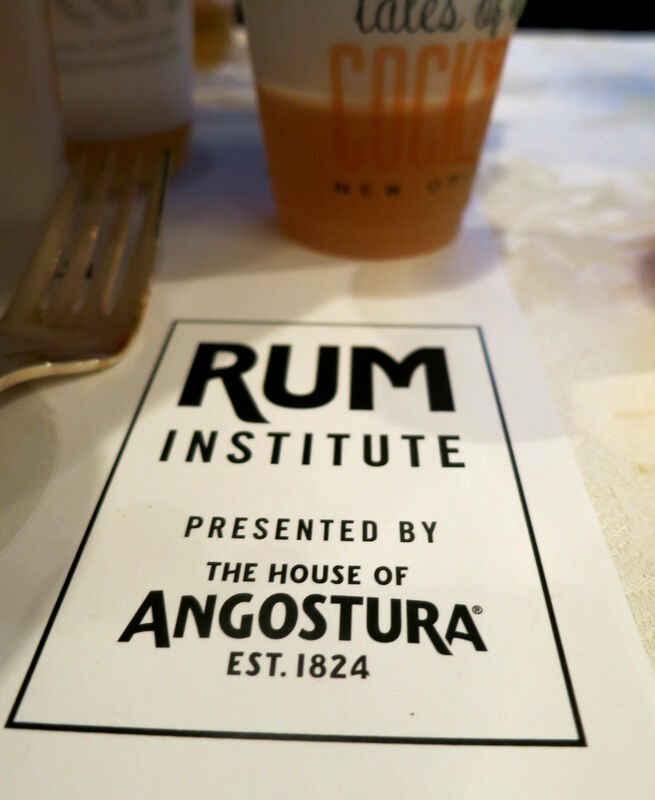 Robert, Leonardo and Paul took us through the history of rum and about the rums selected for this tasting, and then we also got a bonus rum to taste before the official tasting of it, the pineapple rum from Plantation rums. Also we got a quick presentation of the Lost Spirits Distillery by Bryan. This rum was bought unaged and was then aged in bourbon barrels in Bristol for seven years. Light yellowish in color, with hints of citrus peel and raisin and the flavor is balanced with notes of light tropical flowers. Banks is coming out with a new rum soon and we got a taste of it….my notes says ” lively, fruity, a happy rum with a little wood, a bit of spice with a round nose with hints of honey, tropical fruit and wood. It’s a Connoisseur’s Cut Limited Release, made with Nicaraguan, Jamaican and Guyanese rums. I had never tried Mezan rum before. I found it sweet, a bit delicate, light and complex, some wood, tropical fruits and orange peel. It’s been aged in Europe. Now time for the big boys…two demerara expressions from Velier (Luca Gargano) both fabulous rums! 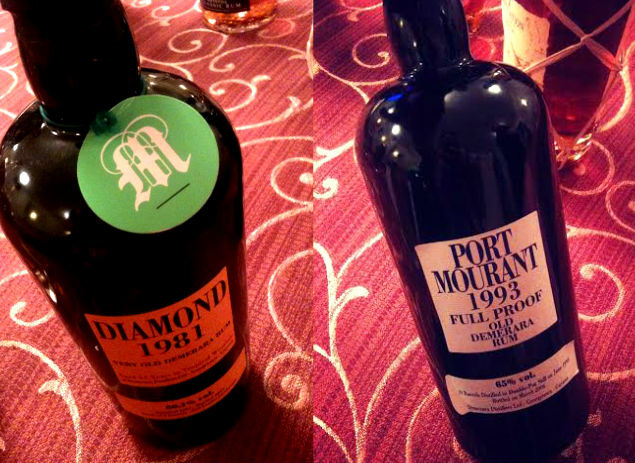 note the little green label around the neck of the Diamond bottle…showing the rum was purchased at my favorite French rum shop in Paris, Christian de Montaguere. Amazing nose….tropical fruits, wood, apricot, almond, cherry…and in the mouth an explosion of flavors….mashed tropical fruits, wood, spice, intense and warm. It gets even better……a 31 year old demerara that has been aged in the tropics (like all Velier rums) it’s a strong and a quite tannic rum and here we get wood, warm spices, a bit of apricot, the rum is amazing, a stunning expression. Demerara rum = Guyana Rhapsody…This expression from Plantation rum is a bit woody, on the dry side, “cool”, with hints of vanilla and fruit, a touch of smoke..
Has a lovely nose, fruity, sugarcane, the flavor is balanced, slightly grassy and floral, a bit dry but has some sweetness, a big rum, very nice sipper. A nice rum, woody and fruity. Long finish. 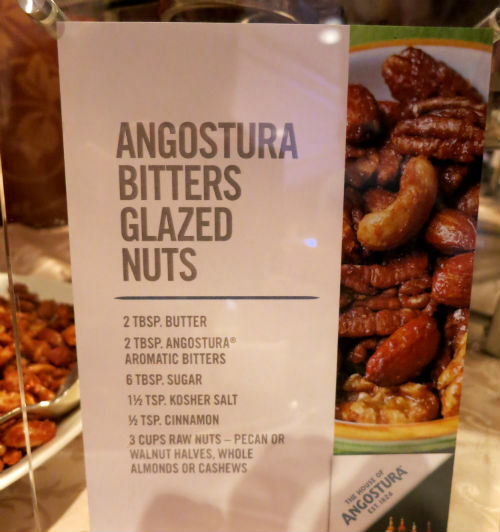 We tasted a range of Angostura rums, the 5 year old, soft and round with notes of tropical fruits, the 7 year old with more robust flavors of chocolate, baking spices, chocolate, coffee, toffee, caramel, the 1919, a premium sipping rum, spicy, peppery, dark roasted nuts, and hints of smoke, and the 1824, aged for 12 years, a rich rum with notes of honey, fruits, chocolate and spices. All these rums are excellent. But we also tasted a range of other rums to compare and try different styles and types of rum. Rum’s place in the history of cocktails, from the very birth of cocktails right through to the present day, with a never-before seen history – and tasting – of the legendary Queen’s Park Swizzle! Making rum! 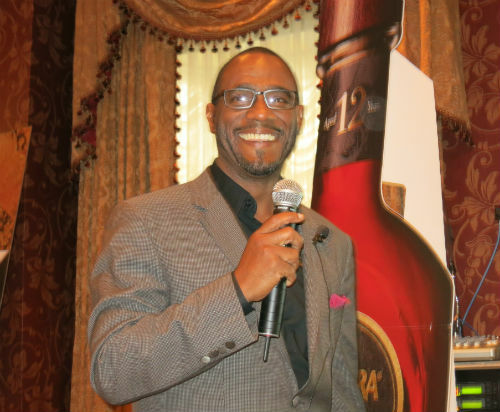 From distilling to blending to aging to bottling, all the subtleties of production that accumulate into the personality of a fine rum, straight from the mouth of the man responsible for one of the Caribbean’s largest rum distilleries. Includes tastings of deconstruction samples never before made available to the public. 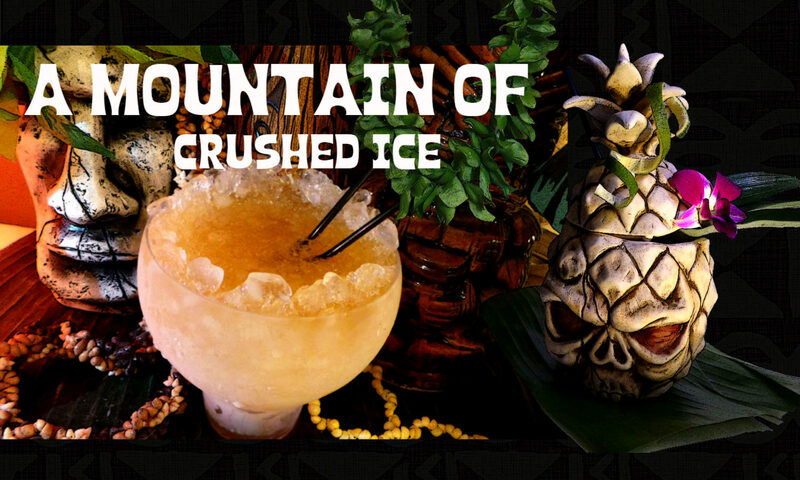 A snapshot of rum in the cocktail world today: The Tiki renaissance, rum in classic and neo-classic cocktails, and boundary-pushing rum cocktails from around the world. Yes it was interesting and fun indeed…and the tasty Angostura bitters glazed nuts and chicken with BBQ sauce was incredibly tasty too! 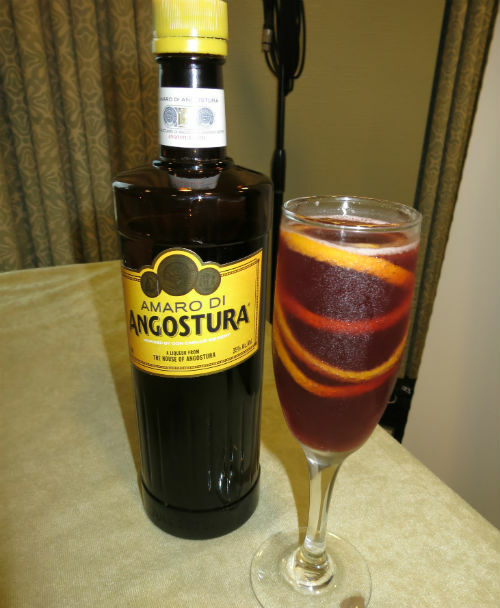 also I think Angostura is a very classy brand from the products they make (love them all) to the way they operate and their team is awesome people. Philip Duff and John P. Georges, and lurking in the background Joey from Rated R Cocktails. 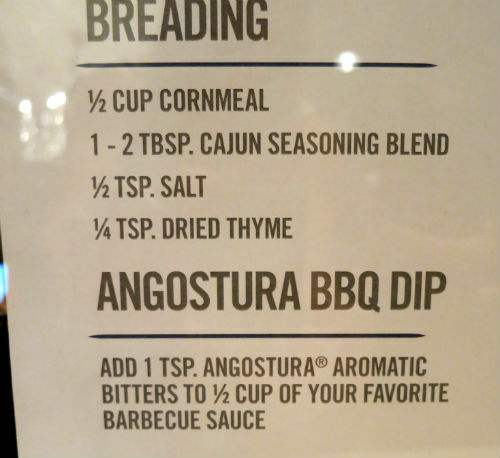 With Angostura Bitters BBQ Dip Sauce…scrumptious! But Angostura had more up their sleve….apart from a orange bitters pool party they also had a spirited brunch and a launch of a new product which turned out to be – amaro – bottled at 35% with aromas of cinnamon, dark chocolate and angostura aromatic bitters. Great on it’s own and in cocktails. Presented by the Angostura brand ambassador Daniyel Jones, people got to sample cocktails and shots with the new amaro made by Ivy Mix (Clover Club NYC) Mike Tomasic (House of Angostura Global Brand Ambassador) Daniyel Jones (House of Angostura Brand Ambassador) and JJ Goodman (The London Cocktail Club, UK). It’s a very nice product indeed! look out for a few cocktails and a review later. Daniyel Jones mixing up delicious cocktails. 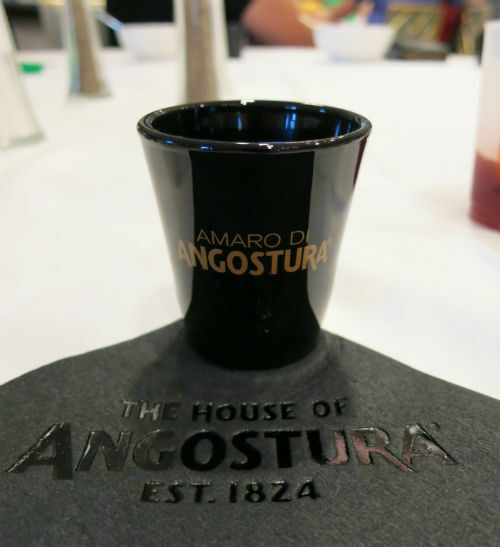 A shot of Amaro di Angostura..
Next up….more tastings! and more rum! Which Rum, What Cocktail and Why? They took us through the history of rum, the tiki era, Don the Beachcomber, Trader Vic… and then a very interesting theory about the rums Trader Vic used in his Mai Tais, or rather the Martinique rum part. Most of us (if not all ?) 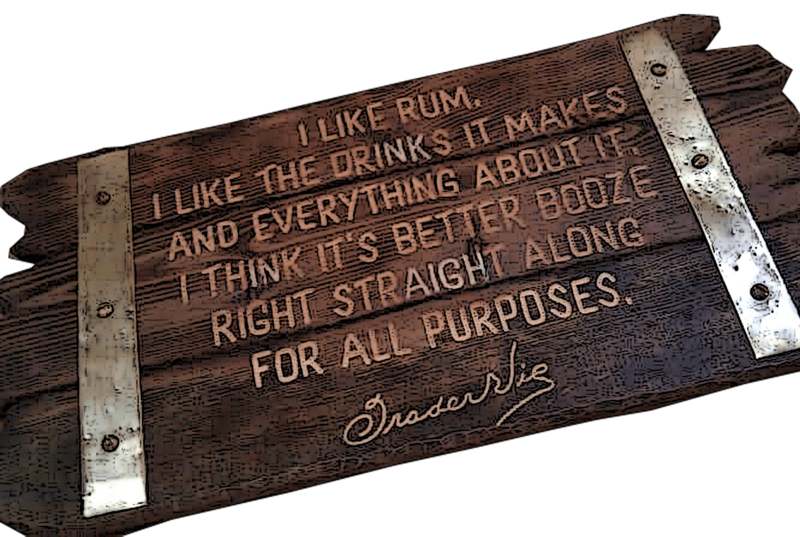 have always thought that the Martinique rum Trader Vic used was an agricole rum, but there is a new theory on this that the rum actually was a molasses based rum and not an agricole. 1. Very few agricoles were exported to the US at that time. Only brand I can see in the US is Saint James. Don Beach had no agricoles at all on his 1940s rum menu. 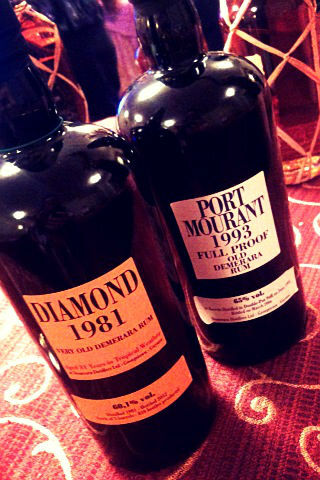 Don describes Martinique rum as “Heavy-bodied, medium pungency” and “Not as dry as the Cuban nor as rummy as the Jamaican” – no word about grassiness or a different raw material at all. 2. 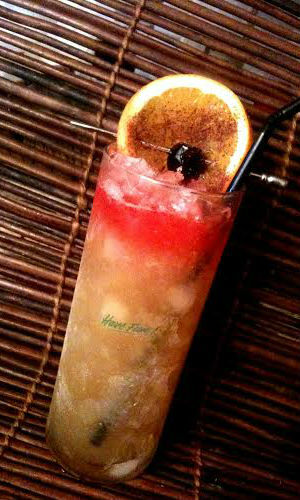 His first Adjusted Mai Tai recipe uses Coruba- lightly aged black Jamaican rum. Heavier bodied, but no depth of character. 3. He described using Trader Vic’s brand Martinique rum in the 1950 to match the desired “nutty” flavor of the older Jamaican. There’s just no way that’s agricole. Also, Vic cited and used Negrita- a black rum from the French islands that is molasses based. So to me it looks like it’s true that the Martinique rum was actually molasses based. 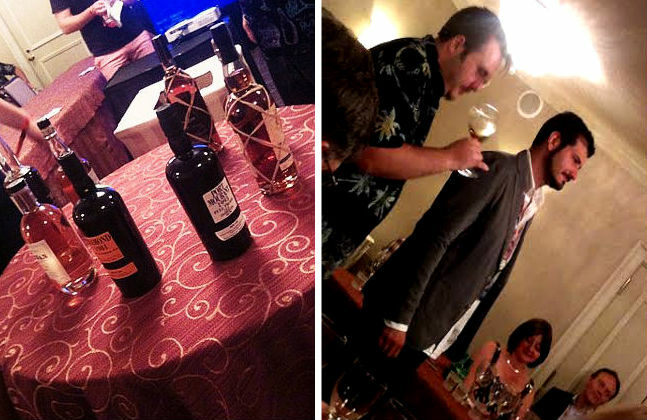 The rum world is really interesting stuff…Sure I wrote a note about this when I reviewed the Denizen Merchant’s Reserve rum which is a blend with both Jamaican rums and molasses based Martinique rum (Grand Arome) but being at this seminar and Martin Cate helped me get more and deeper understanding of the details. 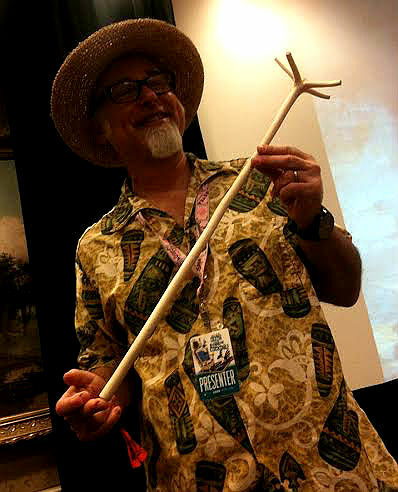 Next up, more about rum….yeah I have a hard time staying away from any seminar talking about my favorite cane spirit…. The recipe for the classic daiquiri was 2 oz white rum, juice of 1/2 hand-squeezed lime, 1 tsp sugar and the drink was mostly stirred but sometimes shaken – “thrown Cuban style” that is. The limes used were the large limes most of us are used to, not the smaller key limes and they were squeezed by hand. Hemingway who moved to Havana and there discovered the Floridita asked his daiquiri to be changed – double the rum, eliminate the sugar (he had diabetes) and adding grapefruit juice and maraschino and the Papa Double was invented, also called the Hemingway daiquiri. His record of Papa Double consumption was 17 drinks from the morning to the evening – he really loved his daiquiri! But he didn’t drink just daiquiris, he also used to drink for example, a cocktail called “Ideal” while reading his daily paper. The Ideal was 1 oz Italian vermouth, 1 oz French vermouth, 1 oz dry gin, 3/4 oz grapefruit juice and a tsp maraschino. One of Constantinos trademarks was the combination of grapefruit and maraschino and he used a lot of fresh mint, sugar instead of syrup, dashes of curacao and lime peel – as ingredient. He became known for consistency and a generally high quality on his cocktails. Constantino also had an “ice program” where different styles of ice were grouped into four: 1 – Menudo (cracked) 2 – Menudito (chpped) 3 – Afeitado (shaved) 4 – Frappe’ (snow) and when the daiquiri was made simple syrup wasn’t used because syrup adds a different texture and taste and instead the sugar was stirred into the juices. So you can see with what great care he took the attention to details in his drink mixing. And from Hemingway Floridita got fame, fortune and became one of Esquire’s top seven bars in the world at the time. Now, Trader Vic, who sat at the bar Floridita to study how tropical drinks were mixed took Constantino’s daiquiri recipe with him when he left and put it on his menu and called it “Trader Vic’s Daiquiri’………and his book the 1940′ s Bar Guide was the result of his studying in the Floridita and Constantino’s work. 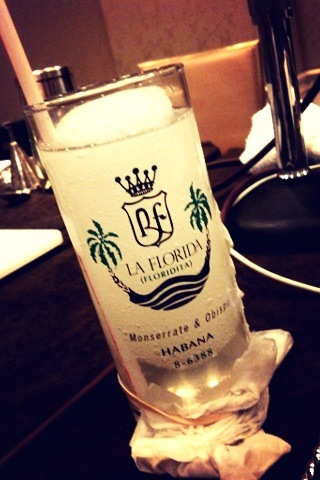 The seminar taught us about the history of Floridita and the history of the daiquiri but there were more things than that mentioned, among them Don Beach, Trader Vic and of course, the Mai Tai, how can you not hear something about the Mai Tai when Jeff Berry is one of the panelists? And to wrap it all up – I would recommend anyone to go to the Tales! it’s such an experience, it’s fun, you meet fun and interesting people and you learn a lot! Next post coming up soon – the tastings! 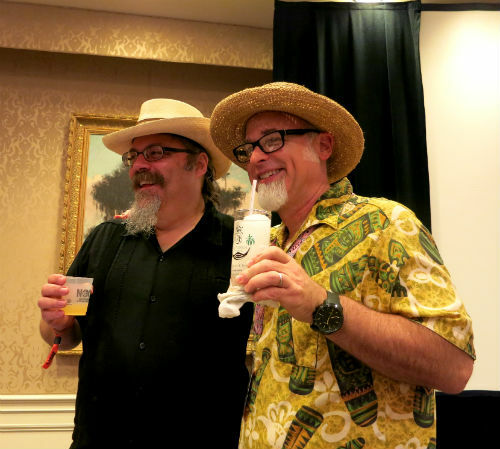 TOTC 2014 – Winners of the Spirited Awards! Best Cocktail & Spirits Publication: Imbibe Magazine (USA). Best new Bartending Book: Beachbum Berry Potions of the Caribbean. Not too long ago i wrote about the excellent Jamaica Pot Still Limited Edition rum from Rum Nation which i`m very impressed with and now they are launching their next rum which is none other than a Caroni…. 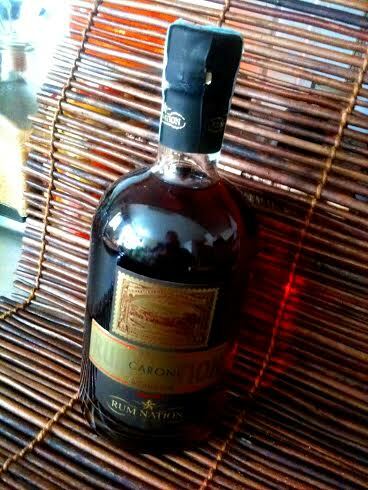 I hold the Caroni rums and especially the heavy types very dear to heart because they are so incredibly GOOD! and i`m so sorry about the fact that the old Caroni distillery is no more making these fabulous rums and unfortunately one day they will be nothing but a sweet memory. But luckily we are not yet there….and so there is still time to enjoy them and they really are true treasures to sip and savor both neat and in cocktails. 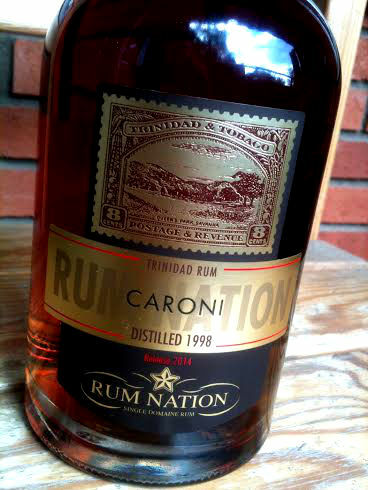 The Rum Nation Caroni is 16 years old have been aged both in the tropics, thus imparting the thickness the angels share produce…(the tropical conditions causes a 60% loss of the distilled spirit due to evaporation) and then aged further in Europe in American Oak casks that contained bourbon then rum Peruano 8yo. The result is an intense dark rum with notes of wood, cloves, cola, coffee and aromatic herbs. The bottle is a beauty to behold…and the label a work of art – it has the characteristic stamp on it – the stamp on the bottle is due to Fabio Rosso being an avid stamp collector in younger years and now adding a touch of class to the bottles with the stamps and a nod to the country of origin – which i find lovely. There were originally more than 50 different rums brands produced in Trinidad – by 1950 it was only 8 and today only Angostura is left. Caroni was established in 1918 on the site of the old Caroni Sugar factory and operated until 2002. Eventually Caroni increased the quality of the distilling process and went from the original cast iron still to use a wooden coffey still – until 1945 when they got a copper still which was followed by a single column in 1957 and then a four column Gerb Herman still in 1980. They produced a number of products like Superb White Magic Rum, Creole Punch Rum, Special Old Cask Rum, Felicité Gold Rum, Caroni Puncheon Rum and Caroni Bay Rum. For nearly 100 years Caroni has had large sugar estates on the island and was the major producer of molasses. Sadly now since it`s closed no more of their magnificient rums are produced and when it´s gone it´s gone. And that is sad because the Caroni rums are unique. That said i must confess i haven`t yet tried many but the ones i`ve tried have all been outstanding and original in the same way as the demerara rums are. And i must say the flavor of the so called heavy Caronis DOES remind me quite a bit of a demerara rum, it has the same full bodied character but without the demerara flavor – but there`s something similar…it has the same type of character despite of being a totally different rum. Nose – In the nose i feel wood, orange peel, sugarcane and tropical fruits. Mouth – It`s smooth with hints of wood, kola and toffee, aromatic spice and tropical fruits. A few drops of water mellows it out and brings out more fruitiness and i get the flavor of apricot. I like the fruitness in it and it´s not too sweet either with a sugar content of 5 g/l. I tried it in a daiquiri and as expected it made a great daiquiri and what i call a “Caroni daiquiri” with it´s distinct flavor from the Caroni rum. A couple good dashes of Bitter Truth creole bitters (or Peychaud`s) on top of the ice gives the drink both a pretty color and a layer of spicy “creole-bitters/peychaudish” flavor that you`ll feel the taste of by the end of drinking. Speared cinnamon powdered orange slice and maraschino cherry for garnish! Shake and pour into tall glass filled with crushed ice. 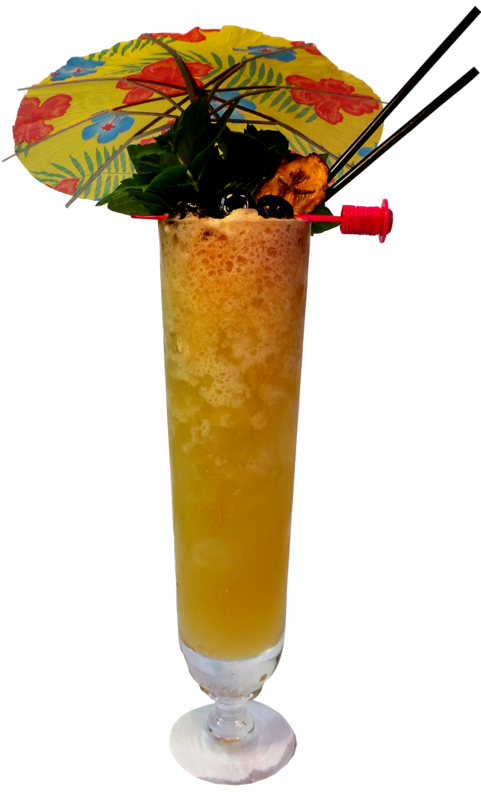 This is a refreshing fruity-rummy drink and it got a wonderful aroma from the cinnamon powdered orange slice…it`s rummy, fruity, a little spicy and the Caroni rum flavor does shine through. If this rum was on the shelves here i`d definitely buy it as a staple for my homebar. I must say that Rum Nation does not disappoint me!